Do you realize how great this movie could have been? The Monuments Men has an extremely compelling story to tell and a cast to do it, but when all is said and done, it doesn’t really achieve the task at hand. It’s about a team of architects, archivists, and artists assigned to retrieve thousands of pieces of priceless European art stolen by the Nazis before they are destroyed in the waning days of World War II. The idea is suggested by Frank Stokes (director and co-writer George Clooney), and approved by the president. From America, Stokes appoints four men, with the names of Richard Campbell (Bill Murray), Preston Salvitz (Bob Balaban), Walter Garfield (John Goodman), and James Granger (Matt Damon). There are two from Europe; from Britain, Donald Jeffries (Hugh Bonneville), and from France Jean Claude Clermont (Jean Dujardin). The team finds out what has been taken, and figures out where it might be. Along the way, a French curator named Claire Simone (Cate Blanchett) becomes vital to locating much of the stolen material. Another supporting character is Sam Epstein (Dimitri Leonidas), a Jewish soldier who fled Germany for America with his family in 1938. He’s mostly unseen, but acts as a translator a couple of times. I had to consult the iMDB for character names. One of the key flaws with The Monuments Men is a disorganized and disheveled way of developing and introducing its characters, to the point where the viewer doesn’t really know who these great actors were playing. I spent a considerable amount of time thinking about better projects the main cast had been in. The Monuments Men is never at a loss for a well performed scene, but it never really combines into a cohesive or memorable film. This is the fault of the screenplay and possibly the editing. It’s a choppy and jerky affair, hard to follow and even harder to care about most of the time. 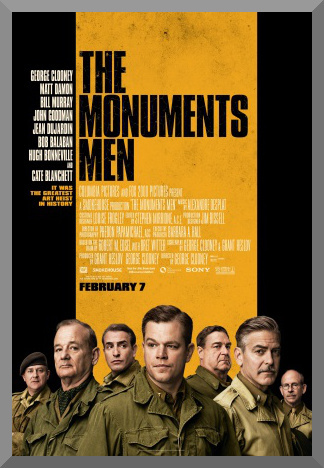 There are seven “monuments men”, and as the story moves on, the group splits up and it becomes a series of tangents, never a fully flowing narrative until the climax of the third act. It’s a disappointing event of thinking about what the possibilities are, and realizing how they’re never reached to their maximum potential. The 118 minute movie suffers a bit in its pacing, especially at the start, with countless amounts of hasty exposition turned against a general disinterest. You’re greeted with an awful incessant speed. The production design uses every warm color it can find in the interiors, creating a glowing sense of nostalgia, as if to initiate the ghosts of the World War II films of days gone by. It never really feels like a successful tribute to that, or nearly any kind of film. The Monuments Men more often than not comes off as a realm of iconic actors misshapen by the script and odd editing flow. I really wanted to love this. There are so many excellent components in The Monuments Men that it can be called nothing other than a real, real shame that it should not turn out as anything less than a spectacle. It’s such a sadness to watch this as the end result, occasionally stirring but never consistently. You yearn for more yet can’t handle another minute with the sluggish pacing, you love the actors but can’t remember who they’re playing, you make a point to read Robert Edsel’s book to learn more about this otherwise fascinating part of World War II, and you wonder why you didn’t see that move with the Legos everyone’s been talking about.